23-year old MBM Motorsports Rookie driver Chad Finchum has had quite the week at Daytona International Speedway. Finchum and his No. 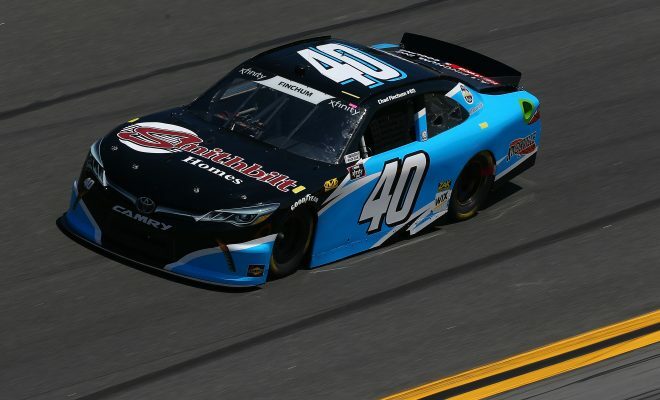 40 Amana Toyota Camry lead the final NASCAR Xfinity Series practice from Daytona on Thursday for the Coca-Cola Firecracker 250 with a fast lap of 185.567 mph and Friday evening he’d earn his best career NXS finish. 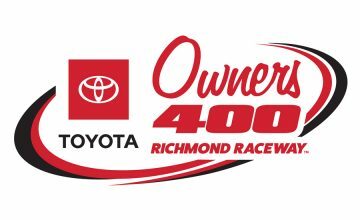 Due to qualifying being rained out the field was set by owners points which meant Finchum would start at the back of the pack. After starting 35th, Finchum worked his way to the front while working very closely with teammate Timmy Hill through out the evening. Finchum was able to avoid any major damage from the multi-car wrecks that took place. He did sustain slight damage with under 20 to go but he stated over the radio that he was confident it was fixable. During the red flag clean up that followed Finchum sat 9th in the running order. The driver would come to pit road, so his team could access the damage and make necessary repairs to his No. 40. Finchum would have to battle back yet again after fellow competitor Brandon Hightower went for a spin and then crashed into Finchum causing a tire to go down on his Toyota and bringing him down pit road once again. With 7 to go there was another wreck which Finchum would sustain some right front damage. He would pit yet again to make sure he was good to go for the finish. 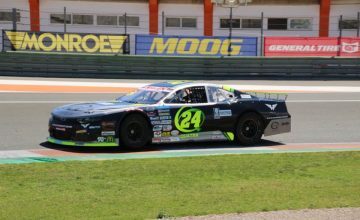 The green white-checkered flag had Finchum scored in the 17th position and as he crossed the checkers he was initially scored as finishing 15th but due to the leader at the time being penalized for passing below the yellow line Finchum was credited with a 14th place result. After earning his career best finish I had the opportunity to ask Chad some questions following Friday evening’s race. Sarah Handy: How was the car in the draft tonight? You led final practice, so the speed was certainly there since getting to Daytona. Chad Finchum: The car was really fast all weekend and I knew we had a great car. We had a plan with our teammate to just survive the first stage and second stage and then stage 3 we were going to go for it and that’s what we did. We got up to P9 with about 12 to go and caught some damage that really took some speed away from our car. I felt like with no damage we had the car to beat in all honesty. SH: Tonight’s 14th place finish is your NXS best, that must give you momentum heading into the next race? CF: Best career finish in NXS is amazing! I really want to top this one now and I feel we can do it soon, our program at MBM is stepping up. SH: Heading into Kentucky would you say it’s a race track you enjoy racing at? CF: Kentucky was my second career start in NXS with MBM last year and I think we ended up with P29, and I love that track. I really feel we will be very strong there this year as well. If you would like to follow Chad or his team on Social Media, the links are below.